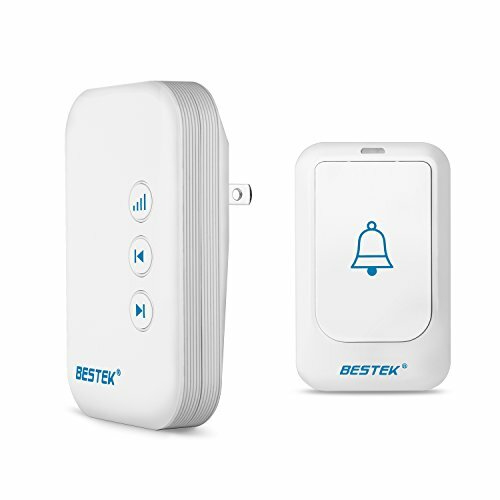 • With different plugin chimes and button options, this BESTEK doorbell kit is perfect for your homes or large apartments. The extra chime makes it easier to hear the doorbell regardless of where you are in your home. Both chimes have 36 tone options and 4 volume levels. • Self-learning design with over 1million frequency codes simplifies programming and helps prevent interference from other users or appliances. • Each receiver can be worked with 4 additional push buttons and it will only retain the last 4 codes if you pair with more buttons; however you can pair multiple receivers with single button. • Long press the volume button for 3seconds and press the push button at the same time, then you will hear the receiver was paired successfully. • If you want to re-pair a new set of 4 push buttons, you may unplug the receiver for 30seconds, plug it in and repair the new set then all the preset codes will be cleared away. • Please do not install the transmitter close to metal for better signal transmitting. • Offers 18 Months Warranty and Friendly, Easy-to-Reach After-sales Service.